S/R Levels – When Do They Become Invalid? I produced a few articles on general S/R theory a couple of years ago. At the very least, please read the recent blog post prior to this article. Now, in writing all of the above, one thing I don’t appear to have ever discussed is when I will invalidate a level and remove it from my chart. Those that have been broken which I assess as potentially still significant in other traders minds. It’s easy to find those that have not yet been broken. Moving higher from the current price we mark swing highs, areas of congestion or gaps. And moving lower we mark swing lows, areas of congestion or gaps. For those that have been broken, it’s a lot more subjective. We have to ask whether or not it’s a level still fresh in trader’s minds. Are traders likely to still be trapped from the break of that level? Or was it recent enough for them to recall the pain of the break of that level? Remember, price action is a result of orderflow, and orderflow comes from trader decision making. If a level still recalls emotional pain, then it will influence orderflow again. If it’s forgotten, then it will have no influence. If a level occurred 18 months ago (to use an extreme example) it will have no influence at all now. But if an area of support was broken only half an hour ago and is now being tested again for the first time… it’s still valid. So, without being able to give a hard and fast rule, as a generalisation we expect recent levels to be more relevant, and especially so when they’re involved with an emotional incident such as breaking of the level. 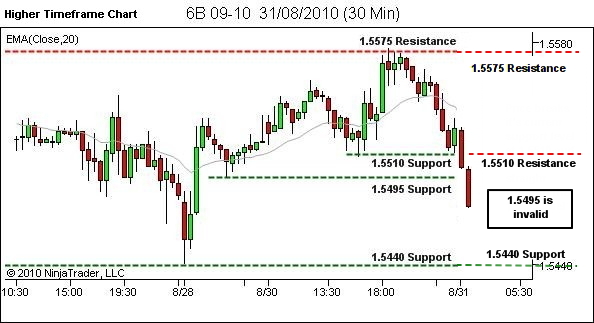 A good example of this is the common occurrence of support becoming resistance, and resistance becoming support. In my opinion be no longer significant in other traders’ minds. Sorry I can’t provide more hard and fast rules. It’s a subjective thing… as is so much of chart analysis. Let’s look at an example though, which I’ve lifted out of the YTC Price Action Trader (which discusses S/R in much more detail, by the way). In this example, we’re using the 30 min chart to identify our higher timeframe S/R. Moving upwards from current price we have resistance at 1.5575. 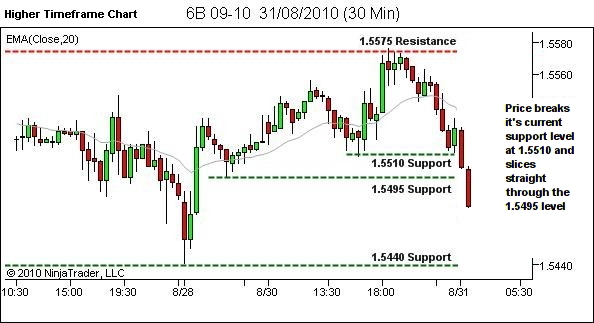 Moving lower we have support at 1.5510, 1.5495 and 1.5440. Simple. Now, let’s say price moves lower, as shown below, slicing right through the 1.5495 level without any pause at all. Which levels are still valid? The unbroken levels are simple. 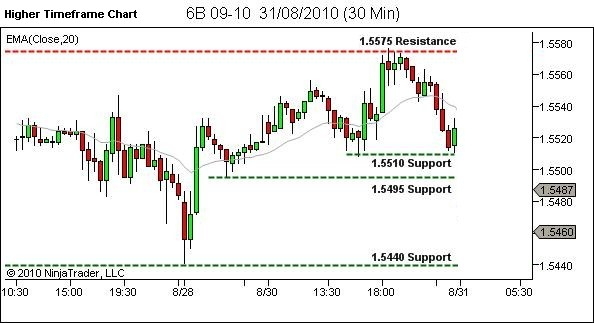 1.5575 resistance and 1.5440 support are still untested, and remain on our chart. However 1.5510 and 1.5495 have been broken. Are they still valid or not? Are they still significant in other traders minds? If I was trading this, I’d leave 1.5510 as potential resistance, but remove 1.5495 as no longer valid. Because price showed a stall at the 1.5510 level before crashing lower. People bought here. Some will have lost money; others will still be holding on in desperate hope of a breakeven exit. The level is recent and is a source of emotional pain. It stays on my chart. 1.5495 provided almost no support as price slid straight through. There was likely to have been little buying here, and therefore a lot less emotional pain. This one’s gone! So, hopefully that helps you with your S/R levels. Great article, I’m relieved to read that S/R levels do become invalid, my charts are getting too full. I do have a question though which in a small way involves S/R at 1.5495, (middle or last chart on this article) but is more about the red candle that’s falling through it. I apologize if this is slightly off topic. As price falls creating the body of the red candle, would there have been any buying going on inside the body itself? I am thinking that price falling is a result of sellers being more desperate to sell then buyers are to buy, which to my understanding leads to sellers accepting lower bid prices, creating the transaction necessary for price to fall. For there to be a transaction though there needs to be a buyer too, no? Am I missing something? If I do happen to be right, then wouldn’t there have been some traders ( perhaps not many) buying at 1.5495 which would lead to them being in immediate drawdown and stress? thank you, I know this question must seem like a weird one so I appreciate any clarification. Yes, absolutely correct. Every transaction involves a BUY and a SELL. Re-read YTC PAT sections 2.2.3 and 2.2.4. What drives price through this level is the fact that the urgency to sell (across all market participants wanting to transact at this time) far exceeds the urgency to buy. So yes there was buying, but as it was insufficient in strength to show any influence at the level, I choose to remove the level from my chart. This does not mean it won’t ever play a part as future S/R. But it’s less likely to do so in the immediate future. And if it does, I’ll simply adjust my premise and my trade decisions to adapt to this new information. To the other part of your question… yes a portion of the BUY transactions will be traders entering new long positions… and they will be in a drawdown. So as I mentioned above there may be some future S/R influence. But again, it wasn’t enough orderflow to cause visible influence on the way down so I’m not so interested in it on the way back up. Another portion of the BUY transactions would have been those closing out a prior short transaction. A final point – it’s important to remember that we don’t just blindly buy or sell at S/R. These are just potential areas of future influence. We assess the way price enters the area to see if it offers trade opportunity. The same applies for levels we’ve removed. If they do subsequently appear to offer further support or resistance, this will become evident through the way price behaves there and we’ll adapt accordingly. So it’s not essential that we get our levels 100% correct. We look for areas that showed S/R in the recent past, and mark them as potential areas of influence in the future. But beyond that we adjust and adapt depending upon how price behaves.